This question is not directed at A.R. 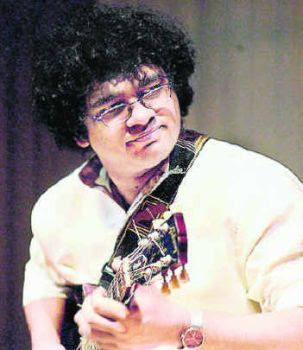 Rahman, but to R. Prasanna, who has delighted rasikas with Carnatic music concerts on his guitar – and is a jazz musician as well. Mylapore–bred Prasanna provided the music for the short documentary “Smile Pinki", which won at the Oscars this week. The film narrates the treatment of the eight-year old Pinki, who was afraid to smile because of her cleft-lip. Pinki, born in a poor family in Mirzapur, Utthar Pradesh, was teased mercilessly by other children. After surgery sponsored by ‘Smile Train’ the international NGO, and performed by Dr. Subodh Kumar Singh, she learns to smile. The picture has been made in Hindi and Bhojpuri with sub-titles in English. The movie is produced and directed by Megan Mylan, based in San Francisco, who wanted a purely Indian score for the film. She approached Prasanna and told him her requirements. And he obliged. Listen to this. Prasanna became involved with Carnatic music at a young age, listening to his sister learning it. He studied music from violin vidushi A. Kanyakumari. He has also played the guitar for some of A. R.Rahman’s film compositons. A graduate of IIT, Chennai, he later studied music in the Berklee College of Music in the US. He now lives in the US, and is the proud father of a one month baby who likes to listen to her dad play classical on the guitar. We don’t know if Prasanna was at the Oscars, but Pinki was, with her father and Dr. Singh. The NGO sponsored her trip. A few weeks ago a new branch of a nationalised bank opened practically next door. We thought it would be very convenient to open an account here, because of the proximity. I felt that my mother too could benefit by it. And so we went, and opened two accounts, one for my husband, and one for my mother, after depositing Rs. 1,000 each, giving copies of our ration card, passport, and whatever else was required, (no, they didn’t want our birth certificates or marriage certificates, nor our school leaving certificates) and our photographs (two copies each, please). The manager was very nice, friendly and helpful. He told us we would receive the cheque book and ATM card by post soon. Once upon a time it was a small matter to open an account in a bank. In fact, I remember once that bank officers/ employees, visited us to inform us that their bank was opening a branch in the neighbourhood, and why did we not open an account with them. Fully flattered, we smiled and nodded, and went to start the account. It was as simple as that. We just had to deposit a minimum amount (Rs. 5, I think it was then without cheque book facilities) and lo! you had an account with them. They smilingly handed over your passbook, and a cheque book with 20 leaves – for this, however the minimum amount required was Rs. 50 or so. Alas, life did not remain so simple. As technology advanced, so did our con artists’ technique - like stealing cheques from the post. My husband has told me about numerous occasions when PF cheques were stolen and deposited in another bank under a fictitious account, using the name in the stolen cheque. So then was introduced the system of getting introduced to the bank by an existing account holder, if you wanted to start an account. And gradually the minimum account increased to Rs. 500, if you needed a cheque book. At some point a system of paying for the cheque book was introduced, depending on the number of leaves you used up. (Maybe the bank wanted us to keep the money there, and not spend it?). So one used cheque leaves sparingly, and using the renewal leaf in the book, kept acquiring fresh cheque books. It was a very simple system – you deposited money, you spent money, all was recorded in the pass book, and no confusion anywhere. Now I need an accountant, or at the least a more informed mind than mine to interpret my bank dealings from the pass book or the computer print outs. It is more than a month now since we opened the accounts in the nearby branch, and we have not started operating the accounts. Why? Because we still haven’t received the cheque books. Why? The manager is helpless. “It is the core banking system,” he says. For an account opened in the neighbourhood, the cheque book has to be mailed from Mumbai ! And it is contracted to some people who will probably do it in their own good time. Till then we cannot withdraw money from the bank. Resul Pookutty won the Oscar! 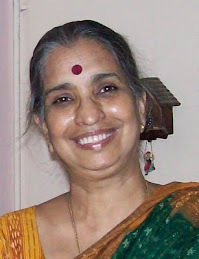 Senior blogger Abraham Tharakan has created a new award Blog Ratna, and has presented it to GVK, retired journalist and tireless blogger. And who could be a better person to receive it? I first came across GVK when I read his blog post on the movie ‘Kalyana Parisu’ and wrote a comment. He responded, asking me if I would like to be included in the bloggers’ group Mysore Blog Park . I checked out the blog and found a collection of assorted writers. The statement under the banner was remarkable, and says it all - We are a bunch that has nothing in common, not even a Mysore connection. Our interests are varied. We belong in different age-groups. We are opinionated, touchy, and take our writings seriously, at times. 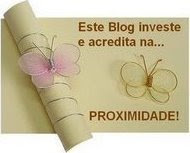 We drive our own blogs and feel entitled to comment, even on matters about which we might know next to nothing. Our pace of posting is irregular. MBP (Mysore blog park) is our parking lot; a one-stop site showcasing bloggers. I was only too happy (honoured, to be honest) to be included in this elite group. Since coming under this umbrella, my posts are being read by more people, and regularly by other MBP writers. On a couple of occasions, I have recommended some bloggers whom GVK has willingly taken into the fold. Can there be a better way of encouraging bloggers? We seem to have formed a nice little family, and it feels good. This bond has extended to exchanging emails, phone calls, and even visits among some – and it is a warm feeling when the virtual friendship overflows into the real world. Thank you, GVK. 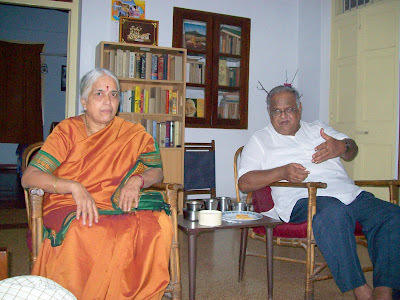 Recently I had the pleasure of welcoming GVK and his wife Lakshmi to our home. We had an enjoyable time, discussing various subjects, from grandchildren to politics, and internet to journalism. After meeting them, the last line from ‘Casablanca’, uttered by Humphrey Bogart, came to my mind -" I think this is the beginning of a beautiful friendship." One of the enduring images in my mind of the late actor Nagesh is from ‘Pacchai Vilakku’- in the song – ‘Kelvi Piranthathu anru’. He walks with a skip in his step, keeping time to the music, listening to engine driver Sivaji Ganesan singing. He is wearing a pair of jeans (in the 60 s very few people wore jeans!) a t-shirt and cap - and looks every bit the Anglo-Indian railway employee. This is his stellar quality – he would look the part whatever he was playing. His face somehow had the anonymity which could adapt itself to any character, allowing him to play older roles even when young. He had a lean, lanky figure, with which he could do wonders, and which allowed him to dance beautifully with any kind of gyrations, even the ballet dancer’s splits, as in ‘Neer kumuzhi’ and later in ‘Kathalikka Neramillai’. If a picture had Nagesh in it, I was definitely interested in seeing it. He peaked in the 60s and 70s, and by the eighties he had been overtaken by a younger crop of comedians (jokers?). I remember seeing him, in the early 80s in our local departmental store Royal Stores, now defunct, and there was nobody around him, no one asking for an autograph, nobody even turning round to look twice. A younger me would certainly have bounded over and talked to him. Nagesh often said that he modelled himself on Jerry Lewis, but I would say he outgrew that, and shone after he found his own niche. His first movie was ‘Thamarai kulam’, (and not ‘Server Sundaram’ as many media reports have said. It was his first movie as a hero). And for some time he was called ‘Thai’ Nagesh, after the movie ‘Thai’ in which he made a name for himself. 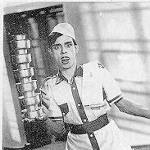 Sridhar was the director who brought Nagesh into the limelight with ‘Nenjil Oru Aalayam’, in which he is a ward boy. Till then Nagesh had been content to play any role – no role was too small for him. And he touched the heights with his role of wannabe–director Chellappa and his Oho productions in ‘Kathalikka Neramillai’. I know people who saw it several times (some of them up to seven times) just to enjoy his comedy. In those days (1960s ) there were no TV channels telecasting comedy sequences ad nauseum. His narration of his film script to his father (T. S. Balaiah) was something new. He could deadpan with the best of them. His portrayal of a waiter-turned-actor in ‘Server Sundaram’, left people asking for more. His friend and mentor K.Balachander had created the role specially for him as a play, which was then made into a picture. He repeated this success as a hero with K. Balachander in ‘Ethirneechal’. The rapport between this director and actor was something special. They were simply made for one another. In the comedy 'Anubhavi Raja Anubhavi' he played the double role of a foolish city boy, and a country bumpkin – a rare feat for a comedian then. In fact, in the movie ‘Panakkara Kudumbam’ with MGR, he even played three roles - himself, his father and his grandfather! One of the best roles he played was that of Dharumi, the impoverished poet, who is looking to win a bonanza in a poetry contest, in the mythological ‘Thiruvilayadal’. No verbal report can do justice to the interplay between him and the arrogant regal poet (Lord Siva in disguise), played by Sivaji Ganesan – in the acting, the dialogue and the body language Nagesh almost outdid Sivaji . In fact he is quoted as having said that it was Sivaji Ganesan’s magnanimity that insisted on retaining the scene as it was shot, for it was evident that Nagesh was the scene-stealer. Another memorable role was Savadal Vaithi in ‘Thillana Mohanambal’, a semi villainous role, displaying a versatility rare in comic actors. In later years he played character roles, right up to ‘Dasavatharam’ last year. He acted in Rajnikant’s first movie ‘Apoorva Raagam’, parts of which were shot on the first floor of our house. The production unit borrowed some furniture from us – and one of the chairs (we still have it) was the one Nagesh sat on. For a long time we joked about never dusting that chair. There can by no means be a comprehensive list or enumeration of this great scene stealer’s films. Only recently, about a week before his death, there were discussions online and in the media about how a current comic actor had been awarded the Padma Shri, while Nagesh had never been given one. To many, like me, Nagesh was the king of comedy, and he will remain that. That would be his true reward, I suppose. In all the hullabaloo made about ‘Slumdog Millionaire', about how India has been exploited by foreign filmmakers and much more along those lines, and about all the awards that have come its way, I noticed one person. With A. R. Rahman (who is modesty personified) being felicitated for his nominations and awards for the film, this other person, who has also been nominated for the Oscar and won the BAFTA award, has been making waves quietly. 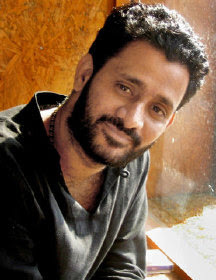 Resul Pookutty. A sound engineer who is responsible for all the sounds we hear on the screen, and how we hear them. And his work has brought him to a level of world-wide recognition. He was born, and grew up, in Kerala, and later graduated from FTII, Pune. A detailed interview with him at RadioandMusic.com is here. Resul is to be presented with the Pattathuvila Karunakaran memorial award in Kerala. He was selected for the award for his contribution in raising Indian cinema to International level. Art does imitate life, and a boy who studied in a village without electricity, and had to travel seven kilometers to school, has arrived on the global stage. I hope he wins the Oscar too. There is no other way to listen to a music concert, I have concluded. The experience was so satisfying – in a darkened theatre, with the artistes pleasingly larger than life and the sound, glorious sound, pouring from all parts of the theatre in stereophonic splendour, excluding all other noises. We had been invited to a special show of ‘Margazhi Raagam’ a film which was a presentation of a music concert by two big names in the Carnatic music firmament – Bombay Jayashri and T. M. Krishna. The show had been organized by Thejus Chandrasekhar in honour and memory of his mother, D. Patammal, who had composed more than 650 songs in Thamizh, in all the ragas of the 72 Melakarthas, and then some more. Margazhi (December 15 to January 15) is the Thamizh month devoted to the Gods (and music in Chennai), and Raagam means melody. It was intriguing. It was a film, and it was a music concert, said the notices. That the singers are two of the best today led to a high level of expectation, but I was not sure what to expect. The two artistes had presented live concerts together recently, and there had been conflicting reports on that. The show was in the Sathyam theatre complex, and before the picture started, there was some western music in the background – which was not at all the right setting for a Carnatic concert. And the lights were dim, unlike at the halls where the concerts are held live, where they burn bright and are never dimmed. And I felt some trepidation. But as the theatre darkened completely, and the credits came on the atmosphere was set. A dark auditorium can hold one enthralled as nothing else. All your concentration is on the one visible place of light. Here our senses were drawn to the screen to the exclusion of everything else. And when the music started, what bliss! Such pure sound, without any disruptions caused by faulty mikes or rude rasikas, who enter and leave auditoriums at will. It flowed from all sides, and it was divine. The aural quality was matched by the atmosphere of sanctity captured by P. C. Sriram’s camera. The first song was by Jayashri, and her soothing voice and serene manner were captured delightfully by the sound engineer H. Sridhar (who died recently, and to whom the picture is dedicated) and cameraman Sriram. She sang two more pieces, and the final line of the 'raagam khamas' was picked up by Krishna after an interlude by the two percussionists. Krishna’s entry was smooth. I had seen only one percussionist accompanying Jayashri and wondered where the other one had come from. He was Krishna’s accompanist! Krishna’s style was in direct contrast to hers, full of flamboyance and vigour, waking up the senses which had been lulled by Jayashri’s soothing voice. After a couple of pieces by Krishna, the two sang together - in great harmony and perfectly complementing one another. The final piece with just the tampura was a revelation. As was the whole experience. Do read Ardra Vamshi's experience here.